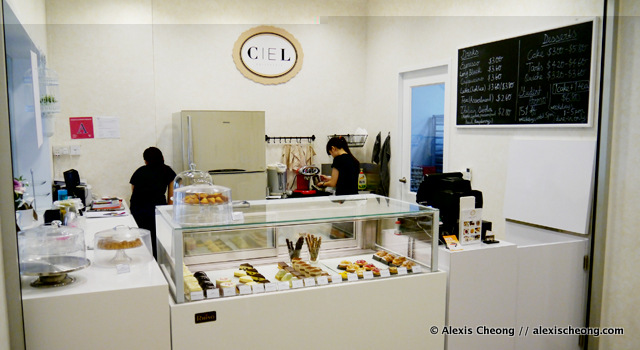 I was kindly invited by Ciel Patisserie last weekend to try out their cakes and pastries. 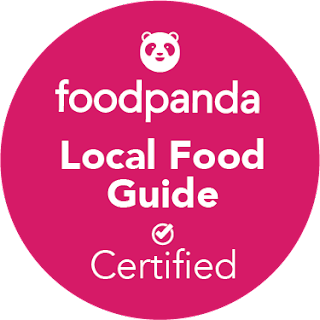 It is located at the very heartland area of Hougang Ave 1 from the previous location at Midlink Plaza and set up by two young adventurous entrepreneurs! From what I heard, the dessert chef's being trained at Le Cordon Bleu Paris. The shop's co-founder is a SMU graduate who has a vision to bring delicious fine cakes to the masses at an affordable price. 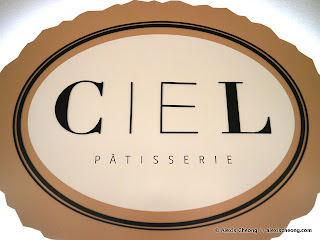 Ciel means "sky" or "heaven" in French. Now that's called community service. We need more people like that! How charming. I love the white, clean yet charming decor of the shop. There's also alfresco sitting outside on cool days, and around 3 tables for 9 inside. I suppose they do a mixture of takeaways and sit-down business. The deliciousness is all laid out in the counter. 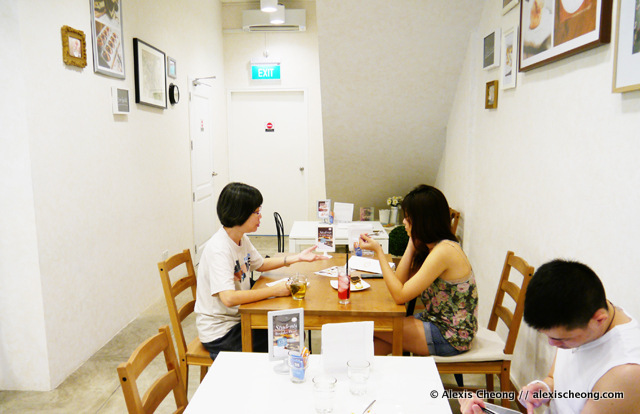 Here are the tables - for ladies to chit chat and gossip, and even to surf your iPad as you enjoy a respite. 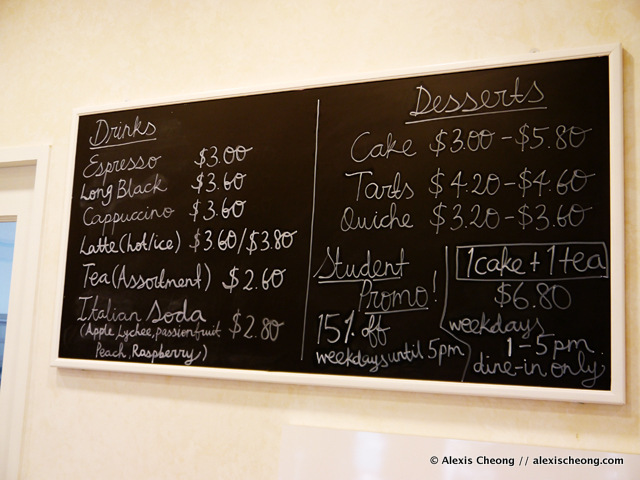 As you can see, the cakes are from $3-$5.80 and tarts no more than $4.60. And here are some of their cakes from the display. They all look so alluring! 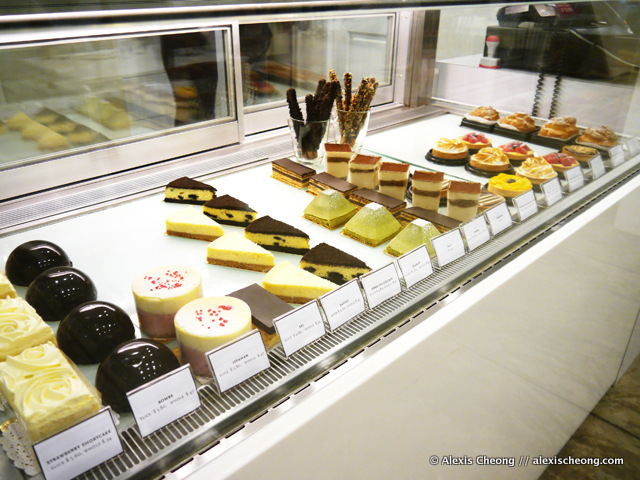 There's a total of 16 types on display, and madeleines on top of the counter. Some of them can be ordered in a whole for special occasions, or if you really really want to eat the whole thing. 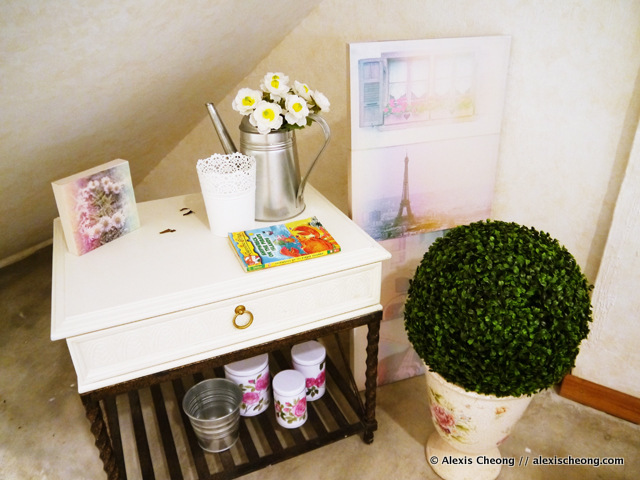 I like this little corner at the corner of the slanted roof of the staircase. Eiffel! Well, on to the food! Do they taste as good as they look? 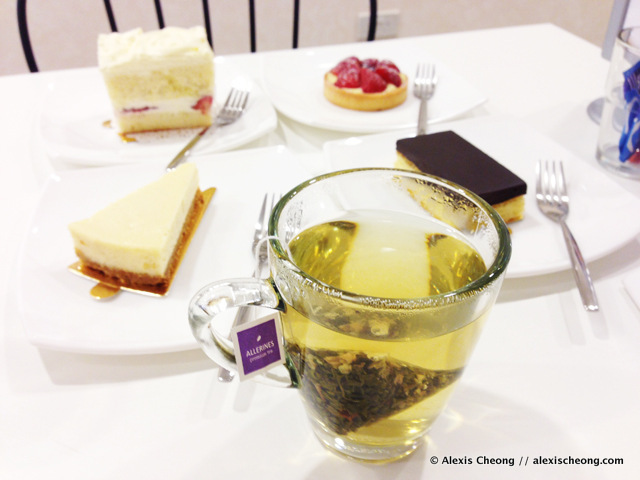 I first had a cup of Sakura Allerines Pyramid Tea ($2.60) to pair with my cakes. It has floral infusions amidst the green tea leaves - very litter, non-bitter and revitalizing. So in no particularly order, here are the cakes. First up, the Satiné ($4.80). I had to pick this because someone reviewed and said it was the 'holy grail' of cheesecakes. I thought that was really quite funny. 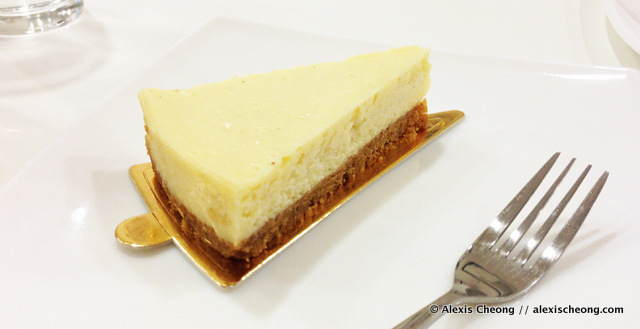 Well, I won't say it is the HG simply because it won't be fair to other cheesecakes, but it is really quite good. 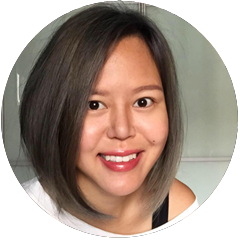 It was light, not too mushy with just the right moisture and texture. The cheese taste was on the lighter side so you won't feel nauseated with it. Instead it is strangely addictive, if not slightly on the plain side. Next, the Strawberry Shortcake ($5.60). It is their bestseller and I can see why! It looks so pretty with the floral cream on top. And it looks as good as it tastes because it was simply... heavenly. 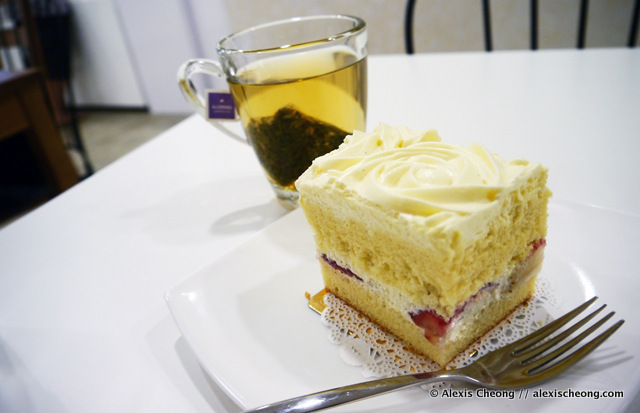 The sponge cake was soft like marshmallow and the cream was not too heavy. 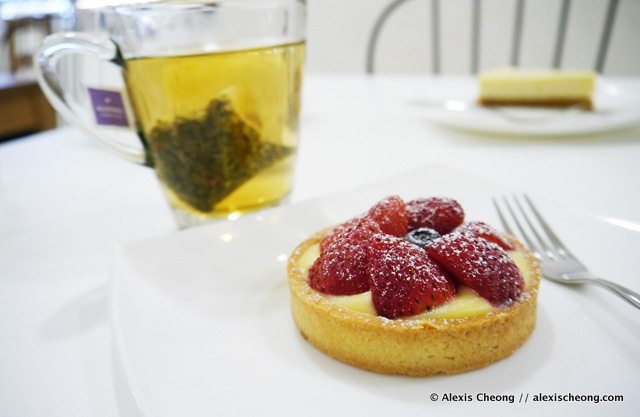 The strawberries provided the tart contrast to the sweet cake and cream. It was a tricky balancing act of flavors and textures and this cake managed to do it. Most importantly it is not overpoweringly sweet. 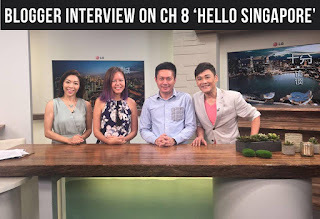 Something interesting next - what happens when you put salty and sweet together? You get the Sel ($4.80) which means "salt" in French. 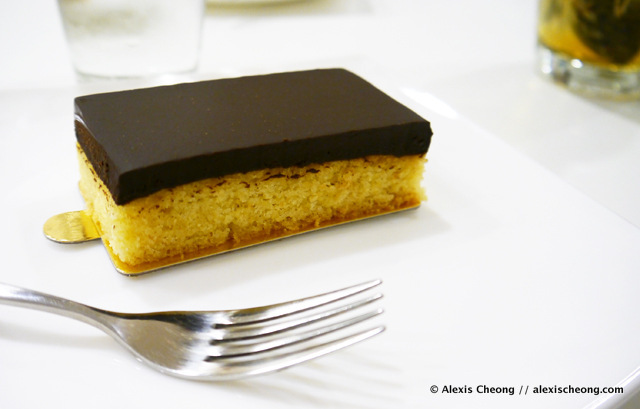 It is in fact sea-salt shortbread base, with a layer of dark chocolate ganache. It was really intense because of the chocolate coupled with the buttery sea salt taste that accentuates the cocoa. You could tell that they used quality chocolate. Lastly, the Fraîche Fresh Fruit Tart ($4.60). 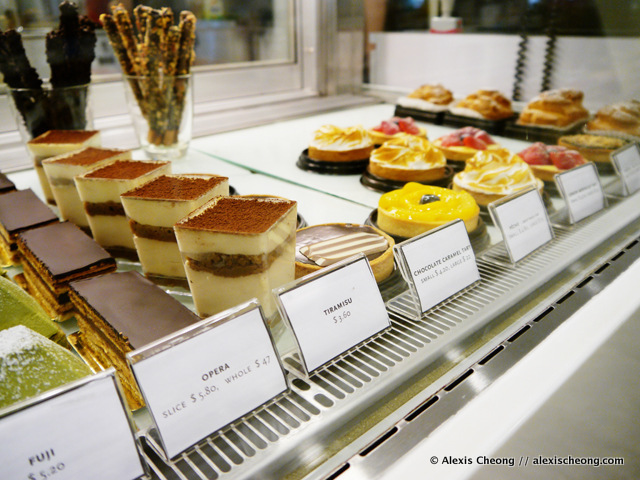 I really like the custard inside the tart, which is made with crumbly buttery base. It was sweet and soft while the strawberries are not too sour. Again, different textures and flavours! 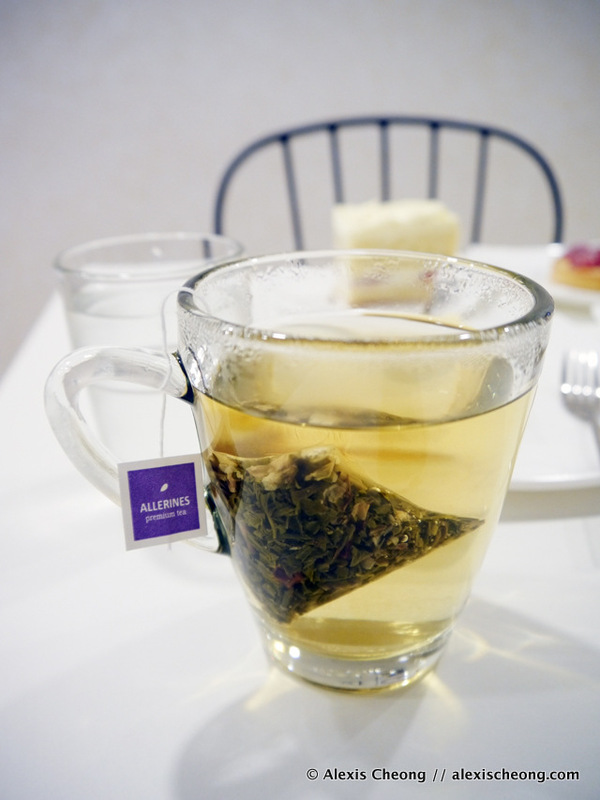 The tart could be quite filling, so if you want a substantial snack in the afternoon go for this! Here's the group shot. 4 cakes at a go, but all so good! I had such a difficult time trying to decide what's my favorite, but if I had to recommend just ONE thing I would say go for the strawberry shortcake. There are also so many other cakes in the shop.. like the green tea Fuji cake with a gelee center, or the French classic Opera cake. 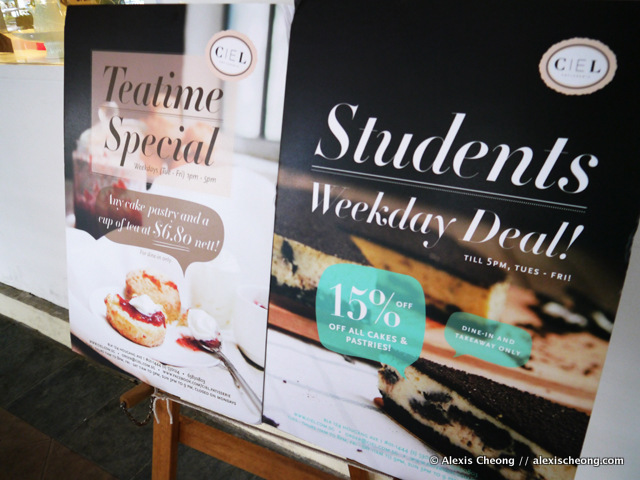 Well to sweeten the visit some more there are teatime specials and student weekday deals! 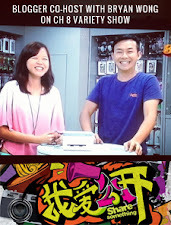 I would imagine this to be the perfect place to hang out after CCA, if I was still in secondary school. Would love to have some quality French cakes and pastries at an affordable price? 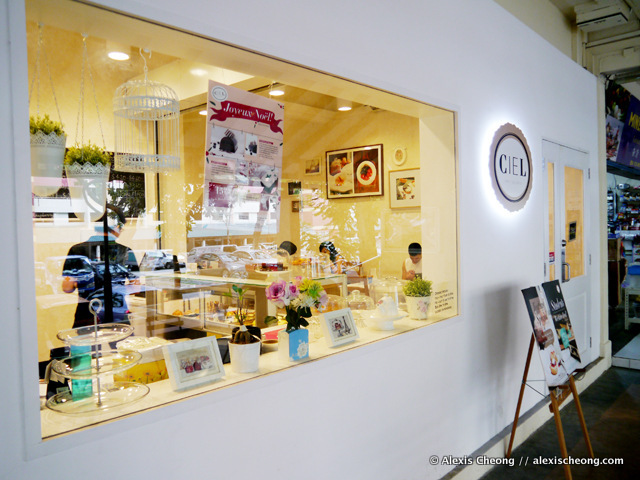 Be anti-trend and head to the heartlands for Ciel Patisserie. 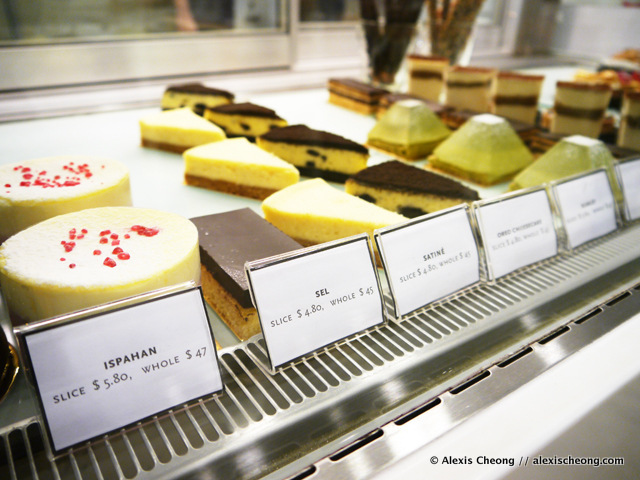 They are almost on par with Flor Patisserie, and wins with local entrepreneurship. They also need YOUR help to spread the word about their shop, so go try it and share this with your friends! Here's a bonus! 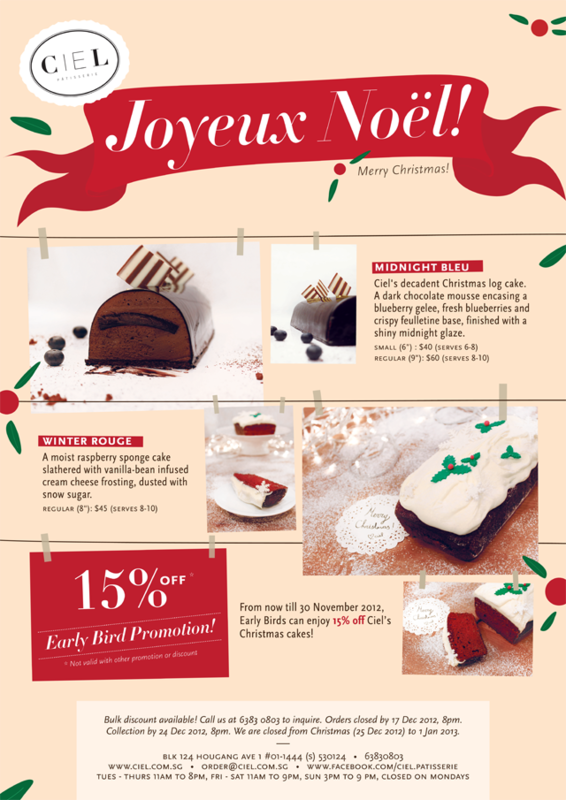 The Ciel Christmas Promo - share this with your friends now!